I arrived in Las Vegas late this morning for my presentation tomorrow morning, just in time for lunch at the conference. Sometimes, timing is everything. For the first afternoon breakout session, I sat in on Craig Roth of the Burton Group discussing how to pick between modes of communication and collaboration. His main premise is that we often use the wrong tools for communication and collaboration — where e-mail is likely the most widely used and the worst — and he presents a chart for figuring out which method to use for which types of interactions. This chart, and using it, formed the bulk of the presentation, and it was pretty interesting. Basically, it has four quadrants, with divisions by “communication” and “collaboration” on one axis, and “asynchronous” and “synchronous” on the other axis. For example, synchronous communication channels includes IM, telephony and audio/video chat; asynchronous communication channels include e-mail, RSS feeds and alerts; synchronous collaboration channels include web conferencing and whiteboarding; and asynchronous collaboration channels include wikis and discussion forums. It sounds a bit complicated, but it’s actually quite elegant and obvious when you see it. He then overlays a decision flowchart on the 4-quadrant chart to show how you decide which quadrant that you should be in, then which tools in that quadrant to use. For example, the initial decision is “purpose of interaction”, where “telling” puts you into the communication half, and “collaborating on goal” puts you into collaboration. Once you’re in the communication half, the next decision is “when are responses expected”; either “now” or “today” puts you into the synchronous communication quadrant, with different channels for each of those two responses, whereas “over time” puts you into asynchronous communication. There’s a number of tools and channels that he doesn’t include here, which he still considers to be under the radar; surprisingly, workflow is included in that group, although it’s not clear what he means by that or why it’s under anyone’s radar. In general, his quadrant chart could be a pretty useful tool, although I find some of the distinctions by content type to be a bit fuzzy. He has some great recommendations on battling dysfunctional behaviours and getting people to use some of the new tools as well. This came to me via the AIIM Toronto chapter, but is being put on by IQPC: Content Week Canada, June 18-20 in Toronto. Maybe they should call it Content Week Toronto? I missed this story on Friday, but the Globe & Mail (and I’m sure many other sources) reported that new federal litigation rules in the U.S. went into effect Friday whereby emails, instant messages and all other electronic “documents” must be maintained by corporations and available for legal discovery. This includes things such as the contents of removable memory cards, work-related pictures on your cell phone and pretty much anything else that you do on an electronic device. This isn’t hugely different than some of the existing compliance requirements, but apparently has a much broader scope in terms of content. Compliance is one of those areas where content and process overlap significantly: the content is what has to be maintained for compliance purposes, but BPM is often used to route and track the content through the compliance process. Questions and comments about the IBM-FileNet acquisition have been coming at me since last Thursday when it was announced, asking for my perspective — many people know that I was FileNet’s Director of eBusiness Evangelism in 2000-01, and that FileNet is still an occasional client of mine, and I also have a number of friends and colleagues who are current or past employees of FileNet. As a shareholder, I’m also monitoring the stories and stock price online to see if it looks like another suitor might jump in — with the current price running higher than the offer price, the market seems to be indicating that that’s a possibility, or at least a pipe dream. To clarify my “speechless” state of last week when this news was announced, I wasn’t surprised that FileNet is being acquired, since rumours of acquisition were rampant even when I was at FileNet and before; I’m just surprised that it’s IBM, since I always figured that it would be Oracle. Phil Ayres has a thoughtful post on how all the IBM and FileNet pieces might fit together, but I’m not convinced that FileNet’s content management has much of a future within IBM. I found Connie Moore’s (Forrester) comment interesting (in this article, among others) that BPM is FileNet’s “crown jewel” — I agree with her sentiment, but think that’s it’s a bit of a hidden gem, unfortunately. I listened to two of the conference calls on Thursday: a very brief one for investors (it was over before I got on it live, but listened to the replay later; for a conference call about the acquisition of a content management vendor, it was pretty content-free), and a longer press call. Ambuj Goyal, the GM of the Information Management unit that will be eating FileNet whole, delivered the usual blah-blah about how the whole is greater than the sum of the parts, how FileNet partners will benefit from an “enhanced ecosystem” and how IBM will preserve and enhance customer investments in both companies’ platforms. Yeah, right. He also referred to FileNet’s BPM as “content-centric”, which means that there’s some pretty fundamental misunderstandings by people how matter about the current state of the product. Then Lee Roberts, CEO of FileNet, started with “we’re all very excited about this announcement”, and I swear that I could hear the rigging on his platinum parachute twanging in the background. During the Q&A, Roberts said that both he and Ron Ercanbrack (FileNet’s president, to whom I reported when I worked there) would be moving over to IBM — it’s worth noting that they’re both former IBM employees — and that “a vast majority [of FileNet’s workforce] will migrate over to IBM”. He also said that the cultures of the two companies are very similar, words that could only come from a former IBMer, I think. FileNet employees: resistance is futile! Prepare to be assimilated! Bruce Silver also caught the conference call and had a few comments, and Cote from Redmonk did a mindmap of the calls. Combine FileNet’s operations with IBM’s Content Management business in the Information Management unit. Since this is the area where they compete most directly, I suspect that this means that FileNet’s content management could eventually be subsumed into IBM’s Content Manager product. Integrate IBM’s BPM and Service Oriented Architecture technologies with the FileNet platform. This is an area where FileNet provides a quite different and possibly complementary product to IBM, so I think that FileNet’s BPM product could actually survive, get properly integrated with the IBM integration substructure, and become the product that it should have been years ago. These are only my speculations as an outsider; I have no inside information and knew nothing of the transaction before it hit the wires this morning. All in all, I’m still totally speechless. Found: an aperture card, reference #xxxxxx, on the road between building A and building B. You can be pretty sure that this is one of the misplaced ones. Is it the fact that online advertising and e-commerce initiatives are back? Is it the prospect of capturing fast growth in the mid-market–the rationale Hummingbird cited for its Red Dot deal? Is it a defensive move in response to Microsoft’s recent signal that it will consolidate the SharePoint Portal and Microsoft Content Manger products? I suspect it’s all of the above, plus a healthy slice of pressure from Wall Street to fuel growth through new license revenue as well as services income. A big part of the answer should be “compliance”, that is, for companies where their compliance requirements include control of the creation and delivery of content via the web, such as securities. WCM as a part of ECM is key for web compliance requirements, because it allows tight control over the processes of how something is published, and also provides a record of what content was available on what dates. I liked the focus on the last of these sections, or what they called “from obligation to optimization”: changing the organization’s attitude from compliance being a chore that they’re forced to implement, to compliance being an opportunity to improve business processes through standardization and measurement. A key finding of our research is that there is no comprehensive compliance management application. Whether buying from one or many vendors to get a solution, you will need significant services for implementation and integration. Partnerships like the one between Global 360 and BWise start to address this problem, but there’s still a long way to go before we can even agree on what “compliance management software” is. The thoughts of my previous post on BPM and agility came on the heels of a conversation with a collegue in Australia who was looking for anyone who had implemented a comprehensive “ECM vision”, including BPM, web content management, records management and document management. It appears that most companies are implementing one large ECM-related project and some bits and pieces of the other parts; I have to admit that most of what I see is still at the hallucinatory stage rather than a full-on vision, and is neither cohesive nor comprehensive. How many cusomter organizations really have an ECM vision, and more importantly, how many have the ability to implement it? Another webinar going on right now, Gartner BPM Roundtable: Business Process Management Trends and Forecasts, hosted by Global 360 and featuring Jim Sinur of Gartner (yes, this turned out to be “webinar day”, I have a third one after this if I’m not burned out). The usual webinar format is the “expert” talks to his slides for 30-40 minutes, then some marketing geek from the vendor talks about their product for 10 minutes. Not this one: it’s a very dynamic conversation between Mr. Sinur and Michael Crosno, President of Global 360, and both of these guys are really smart about BPM. Yes, Mr. Crosno talks about Global 360 product features, but it’s used as a springboard for Mr. Sinur to talk about the importance of specific functionality in the current and future BPM suites marketplace. The second insight is that customer requirements are evolving from enterprise content management (ECM) to enterprise process management: a shift from information lifecycles to process lifecycles. As a “column 2” advocate, I’m really glad to see Gartner recognizing the shift in focus from content to process. Mr. Sinur showed a scale that started with image management and went all the way through to business optimization, with the crossover from ECM to EPM happening between portals and process execution. 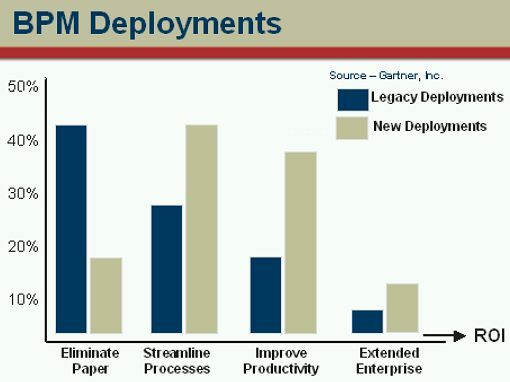 He puts “workflow” in the ECM space, that is, the subset of BPM that is used for content lifecycle management. Another point was the trend for CRM vendors to integrate BPM with their products, usually by buying or OEM’ing in a third-party product, because they see it as an essential part of managing the customer relationship. I’ve been seeing this trend lately as well, such as with Onyx‘s acquisition of a BPM product and their current push to integrate it into their mainstream CRM product. By far the best webinar that I’ve listened to in months. The slides and the audio playback will be available tomorrow on Global 360’s site.